A visionary educational institute established by the missionary Quintin Hogg, the Polytechnic opened in London in 1838. It provided room and board for young men, running classes and activities that encouraged the "spiritual, social, educational and athletic" growth of its charges. Swimming had become popular at the beginning of the 19th century as both recreation and exercise. The sexes were taught to swim in strictly separate classes. 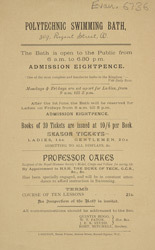 Professor Oakes, here publicising his course, would have stood on a large platform at the side of the pool giving instructions through a loud-hailer.